You're passionate about bringing art to life. Regent's Bachelor of Arts in Animation will equip you to create, innovate, and collaborate in visual storytelling. And you'll learn at one of the most technologically advanced communication facilities on the East Coast. Access cutting-edge computer animation software and design studios. Combine your talent for technology with your passion for the arts. Jumpstart your career with a professional portfolio (i.e., reel) to show potential employers. 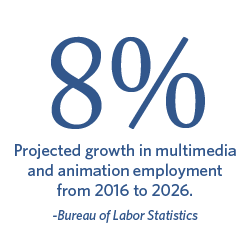 Presented from a Christian worldview, this in-demand animation degree is supported by award-winning faculty in Virginia Beach. Write, storyboard, and create digital special effects using advanced 3-D computer generated techniques. Understand the animation process from conceptualization and modeling to digital cinematography and postproduction. Budget, create business plans, pitch concepts, and market your animation capabilities. Introduction to the principles of animation and sequential art techniques that make up the visual communication art of storytelling through animation. Creation of digital art as needed for animation using industry-standard software through the medium of digital photography and its application to individual expression. Students explore and practice 2-D traditional techniques in animation. Fundamentals of motion graphics including basic motion graphics principles and elements, design and composition, timing and effects, storyboarding and planning, sound and music synchronization. Industry-standard computer applications introduced and applied. Study of 3-D animation principles using Autodesk’s Maya. Prerequisites: ANIM 100 and ANIM 103. Study of the unique opportunities and challenges found in writing for animation in a variety of formats: the short subject, half-hour program, and feature length film, with an emphasis on integrating visual elements such as sketches and storyboards into the writing process from the very beginning in order to maximize creative discovery. Prerequisite: ENGL 101. Students gain the skills required to rig and animate characters in Maya. A fully planned, animated, rendered, and edited 10-second animation is required. Prerequisite: ANIM 203. Explores in-depth techniques for creating quality 2-D animation. Students, working as a team, create characters, storyboards and final animation of a short piece employing traditional methods. Prerequisite: ANIM 112. Study techniques to develop professional storyboards for animation and film. Addresses styles of storyboards and their specific target audiences for utility and value. Prerequisite: ARTA 120. Explores the roles of the various people and positions involved in the production of animation. Pitching, budgeting, and business plans are covered. Each student submits a budget and a business plan for a project. Students also present a pitch for their final project. Prerequisite: Junior standing. Texture mapping, lighting, cameras, dynamics, rendering techniques and MEL are addressed. Prerequisite: ANIM 213. A critical look at the development of animation styles, both American and international. Students view animation and analyze the social, technological, financial, and political factors that helped shape the development of this art form from its beginnings to how television, computers and the Internet have affected the form. Designed to help students build a compelling, well-rounded artistic portfolio to best represent their work to potential clients. Students evaluate and develop presentations of their own artistic work and address deficiencies in their portfolios. Both hard-copy and digital portfolios will be covered. Prerequisite: Senior Standing. History and aesthetics of the field of motion graphics as they are used in film & television. Prerequisites: ANIM 112, ANIM 115, ANIM 203. Course focuses on the motion techniques for 3-D actions that fall between the key frames. Prerequisite: ANIM 314. The process by which digital special effects are applied to film and video productions, using advanced 3-D computer-generated techniques. Prerequisite: ANIM 314 or Permission of Instructor. Students work on the crew of a cinema-television production, animation project, or advanced degree class project. Students may work on up to three productions, obtaining one credit per production with approval of the faculty executive producer overseeing each project. Prerequisite: Permission of Instructor. Special topics courses offered at instructor’s discretion. Prerequisite: Permission of Instructor. The independent study affords the student an opportunity for specialized research or project in the field of animation. An independent study cannot be offered for a course that is already designated and listed. Students must submit a written proposal stating the reason for and parameters of the project, as well as a comprehensive schedule for its completion within the semester format. Prerequisite: Senior standing and permission of advisor. Culminating experience in which the student applies learned skills, demonstrating competency under the guidance of a specialist in the field. Advisor approval required. Under the supervision of the instructor, students work independently to develop a 5-minute animation project, meeting weekly to discuss their progress. Permission of advisor and instructor. Prerequisite: ANIM 310. Students will learn observational skills and drawing techniques to enhance technical abilities and creative responses to materials and subject matter. In-depth investigation of line, perspective, space, atmosphere, erasure, and other key components of animation in a wide range of drawing media will be covered. Weekly group critiques and sketchbook assignments are integrated. Concept and creation of two-dimensional imagery. Practice in basic principles of design, color and visual organization in traditional, digital and lens-based media. Explores the context of imagery in the larger culture and the future of art and design. Intensive practice in correct rendering of the human and animal forms through skeletal and muscular studies looking at stationary poses as well as figures in motion and basic gesturing. Prerequisite: ARTA 120. Three-dimensional phenomena in fine art and design. Cultivates the ability to think, perceive, visualize, design and build in three dimensions using traditional methods and a broad skill set of fabrication techniques. All students are required to have a laptop that is powerful enough to run Autodesk's Maya and their own copies of required software. See hardware requirements and necessary software.